Oh dear! Who painted a spider onto the wall? Who let the guinea pigs into the rabbit pen? Who put the rubber ducks in the pool and who left muddy footprints all over the cloakroom?! 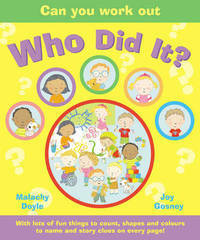 Can you find out who did it?Follow the children as they go through their day at nursery and help your little one find out which of the Whodunnit Gang has done something silly on each page.Keep your eyes peeled for clues and enjoy hours of fun scouring the busy artwork counting, spotting and learning new shapes, colours and words. Malachy Doyle grew up in Ireland, studied in England, brought up his children in Wales and has recently gone home to Ireland again, where he lives on a tiny island off the north west coast. He is the author of Hungry, Hungry, Hungry (Andersen Press), When a Zeeder met a Xyder (Doubleday) as well as many other highly acclaimed books. Joy Gosney is an illustrator of several children's books including (Naughty Parents, Bloomsbury) and an ongoing series of novelty books, My Magnetic Playhouse, Garage, Palace and Space Station and four Busy Buggy Books (Campbell, Macmillan). Her favourite part of picture making is the colouring-in and when she's not working on a new picture book idea she also illustrates extensively for grown ups too! She lives by the sea in Brighton with her husband and their black and white rabbit.